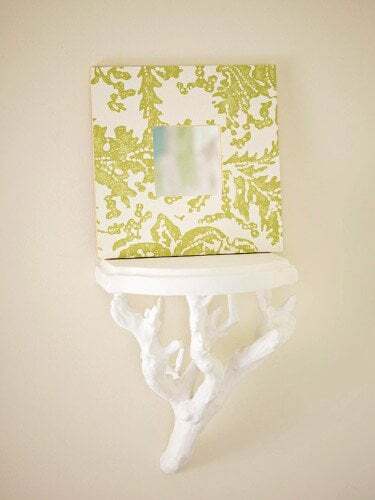 The clever use of a few wallpaper scraps can really change the look of a simple piece of furniture, your walls and art using a few DIY ideas and some left over wallpaper pieces. 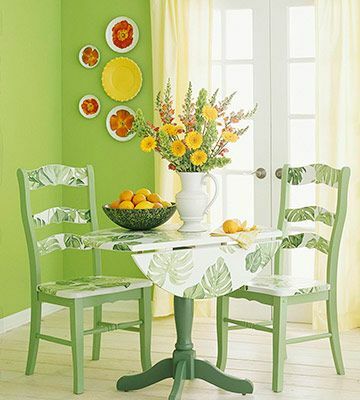 Simple ideas are often the best, like using wallpaper scraps on these kitchen dining chairs and table. Here we look at wall decor, craft ideas and furniture upcycling, all using wallpaper scraps. Maybe some of these ideas will inspire you too. 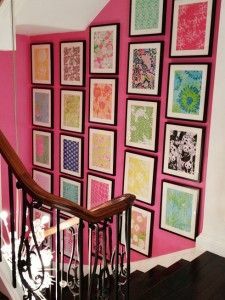 Grouping wallpaper leftovers with a theme - whether its different sized circular frames or similar sized square frames, can be very striking. So can one large piece, framed or unframed. The piece below uses stenciled words to add color and interest. 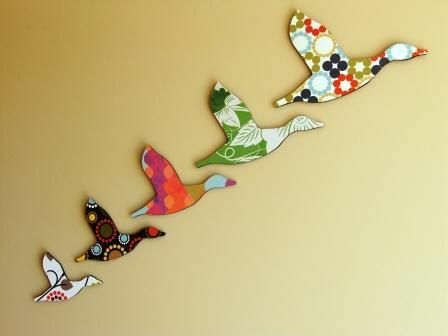 Wall art is one thing but what about these cute ducks on the wall made from wallpaper scraps? They are fun, unusual and a great conversation starter. Each one totally unique, and twisting vintage decor into something different and creative. 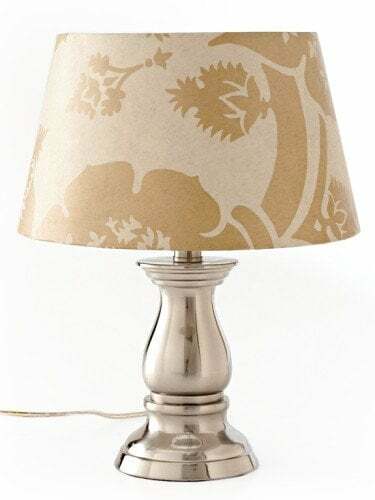 From lamp shades to table tops, trays or the backs of chairs, here are some wallpaper scrap ideas for your home and craft ideas. Wallpaper scraps are a simple decorating tool which can add color and texture to your colors scheme. 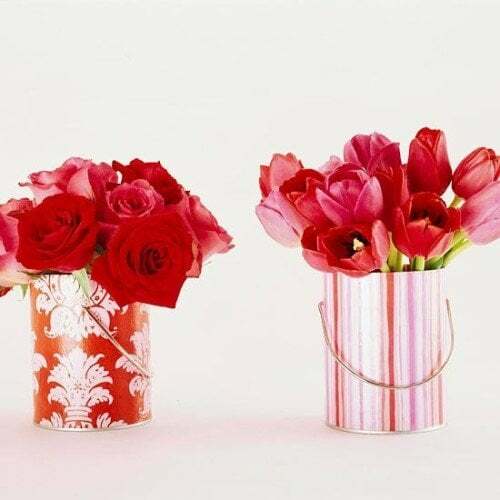 You can easily add pops of color or an elegant design using different styles of wallpaper scraps. Perfect if you have some scraps lying around deteriorating or collecting dust. Gorgeous wallpapers can quickly add mood and texture to another wise neutral space. 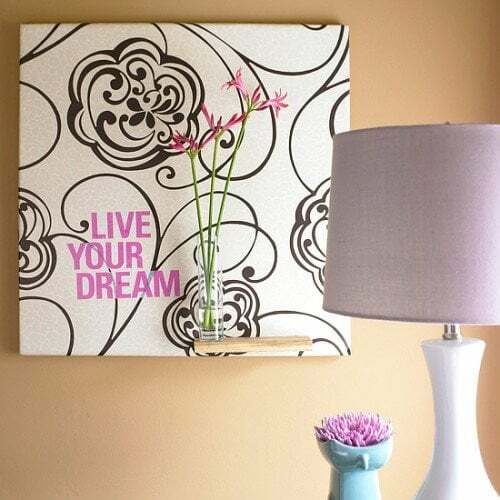 From vintage, floral or classic - even old picture frames or mirrors can easily be transformed using wallpaper left overs. And because you are only using a small amount, you don't break the bank to get a Rockstar look! The lampshade below is covered with wallpaper scraps. Its a great craft idea and easy too. BHG have a great article called Projects Using A Roll of Wallpaper. 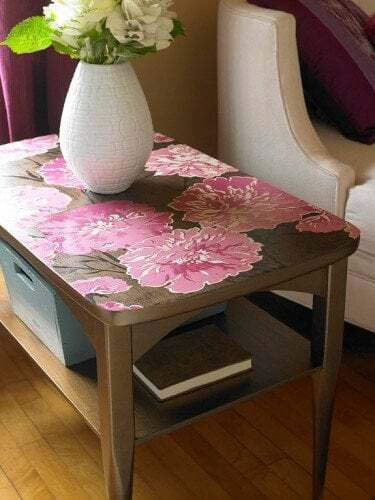 There are 21 DIY projects showing ways you can use old wallpaper or wallpaper scraps to create interesting design looks for little time and money. 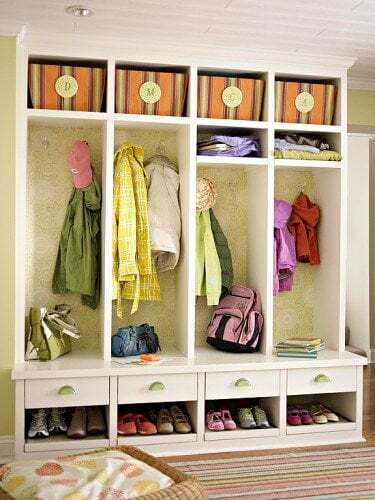 Larger amounts of wallpaper scraps can be used to line drawers, the back of bookcases or hallway storage with great results. You can even go over older furniture pieces that are too difficult to paint. Adding bright floral wallpaper pieces to this old cupboard has transformed it into a great living room piece. 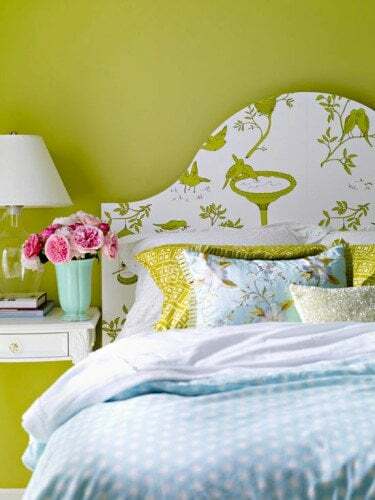 And this bedhead is totally transformed with the addition of a some matching green and white wallpaper. You can get a totally original and unique decorating like these using old wallpaper scraps within a couple of hours. 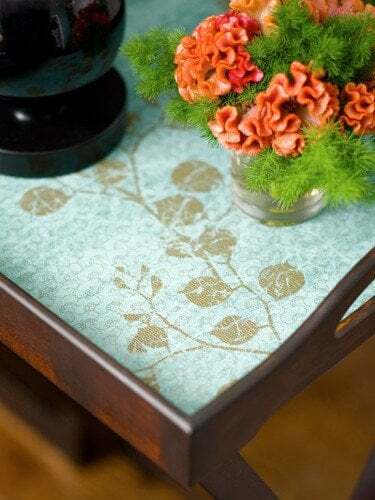 DIY projects include ideas like the one above - creating a table topper from with wallpaper scraps are fast and easy. Dresser revamps are easy when you use left over wallpaper to accentuate and cover panels. 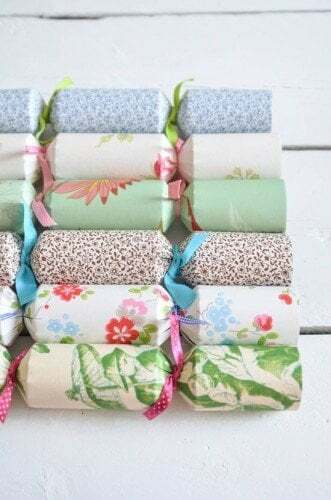 Wallpaper scraps can also be used for Christmas decorations, bunting, Christmas crackers, gift wrapping or upcycling old tins for Valentine's bouquets of flowers. There are so many great uses for old wallpaper. These are just a few. 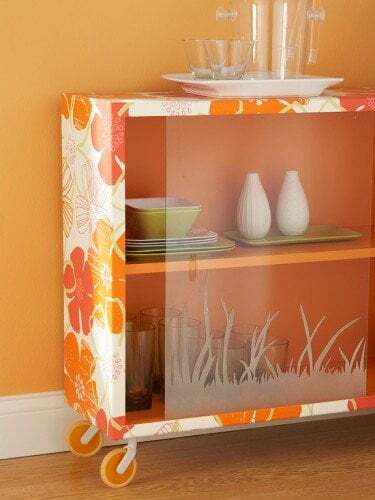 These are all great DIY projects using a few pieces of left over wallpaper scraps. Read Cool Wallpaper Ideas for more tips and ideas. If you like this article or have ideas on how to use wallpaper in DIY projects, please leave a comment. You can share the love by Liking us on Facebook or sharing with friends!